The Club recognising the immense value of swimming and sailing for physical rehabilitation of the disabled shall encourage, promote and develop these activities amongst the physically disabled of Yeovil and District. The Club shall also encourage recreational activities with the object of improving their condition of life. It all began around 1970 and is named after the American Space Missions that were taking place at that time. The Club was founded by a renowned local surgeon and group of others who were using the old Yeovil pool in Huish and realised the benefits that hydro therapy and swimming have in the rehabilitation of physically disabled people. The club soon grew to include sailing and canoeing and also an active social section that arranged gala's, skittle evenings, Christmas parties meals and outings etc. Apart from the canoeing section ,that was disbanded some years ago, that's pretty much where we stand today some 30 plus years later. We annually compete against other similar clubs regionally at Keynsham, Street and Plymouth. We are affiliated to the National Association of Swimming Clubs For the Handicapped and transport a group of members to the NASCH Woodlarks summer camp at Farnham in Surrey every year. We currently meet at Yeovil's Goldenstones Pool on Saturday mornings and at Sherborne Boys School on Tuesday Evenings. We also have a sailing dinghy that we use on Sutton Bingham Reservoir on Thursday evenings during the summer months. 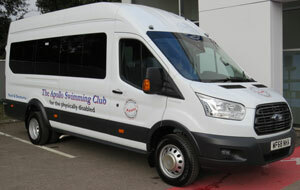 We have our own minibus which we use to pick up members from their homes and transport to the pools and the aforementioned events but we have too many members requiring transport for one bus so we also hire transport from the Council Voluntary service. Transport is undoubtedly the clubs largest running expense. We currently have a membership of around 100 and a committee of 12 elected people and many other volunteer helpers such as lifeguards and drivers etc. Although members pay a small amount for their membership and pool sessions and we raise as much as we can with stalls at local fetes etc, we heavily rely on grants and donations. Members are referred to us by medical authorities and comprise of both people who have a permanent disability and those who have sustained an injury from which they will eventually recover. What is really nice is when someone who has joined the club with a temporary disability makes friends and enjoys the activities so much that when they've made a full recovery they become an associate member and help life guarding/driving or something similar. Our minibus, or ambulance as we call it, is not only a means of transport but a very powerful advertising tool for us. It's got the Apollo Club name on it and advertises the club wherever it goes.